Explore Savannah movie sites and celebrity locations on a 75-minute, guided Segway tour. Use wireless headphones so you don’t miss a word of stories about Hollywood personalities, classic films, and celebrity sightings. 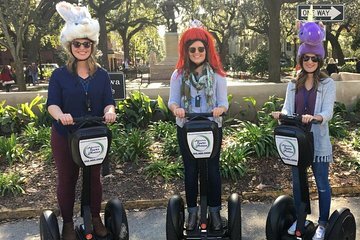 Make your way to a centrally-located office in Savannah’s historic downtown district, arriving 15 minute before start time for Segway training, which includes a short video of Segway basics, and time to suit up in a helmet and practice turning, starting, and stopping your self-balancing Segway. Visit the site where Forrest Gump shared a box of chocolates—his park bench is now in the Savannah History Museum, but the bus stop location is unmistakable—then see where Dennis Quaid and Julia Roberts starred in Something to Talk About. Listen to engaging narration by your local guide as you roll through town, with time to pause for photos at your favorite locations. Get the inside scoop on the places Robert Redford, Zac Efron, and ‘The Rock’ have worked and played while on location in Savannah, and hear behind-the-scenes stories from the filming of movies like Midnight in the Garden of Good and Evil. This tour concludes at the office in downtown Savannah. Closed heel shoes are suggested. You must be 16 years old for this Segway tour but we can offer electric bikes as an option if younger or desired. The weight limits are a between 100-260. If your weight exceeds the maximum please call the office. Please arrival time is 15 minute prior to tour, in order to fill out paperwork and start your training. We will start with a short familiarization video and then the hands-on Segway training. Very interesting. Liked that it was combined with some historical info about the city. Was very easy and fun. Staff very helpful. Great experience. Guide was very patient. Without a doubt this was the highlight of our trip! The segways are so easy to operate and was such a fun way to see all of the historic district. Our guides were fun and very knowledgeable, making for an enjoyable experience. We definitely will do this again and highly recommend it to everyone. This was our first time on a Segway and we couldn't have had a better time. We are in our 60's and this was a bucket list item to do. Mary provided an excellent tour, providing both movie and historical information. She even gave us a great recommendation for lunch after the tour. We had a blast. The tour guide was very knowledgeable and had great concern for out safety as we had to segway in the street Savannah rule. Truly enjoyed the fact that the tour guide could provide a good deal of information via head sets that were awesome. We have taken other tours and we did not had head phones WHAT a difference. When I book any other tours I am def asking for head phones. Tour guide also told us of a great place to eat that was within walking distance of their office and just let me tell you the recommendation was spot on. Next time I would like to take another tour as the movie tour was good - there is so much history to be uncovered. Mary was our guide and she was awesome! She really knew her history and way around the city. She gave us a terrific quickie training session and made us very comfortable on our segways before heading out. We would highly recommend this tour to anyone wanting a unique way to see Savannah! Mary did a good job of explaining the history of much of the area we segwayed through. The use of 1 way headphones is excellent. You can ride and hear the tour guide from dozens of feet away.